Brooklyn, NY - ‘Rivka Schwartz” does not know where she would educate her daughters if not for Shulamith School for Girls, the first Orthodox school for girls in the nation, which has been located in Brooklyn since 1930. But Schwartz may be facing a dilemma when Shulamith sells its building, as is being planned by the school’s administration, and potentially closes its doors for good. “There aren’t any options; there is no school like Shulamith in Brooklyn,” said Schwartz of the school her daughters attend and where she herself went. (Neither Schwartz nor any other parent contacted for this story permitted their name to be used, for fear of retribution by school officials. In an effort to hold on to what they see as a unique school — Orthodox but Zionist, religiously fervent but engaged with the wider, secular world — Shulamith parents are fighting the proposed sale of the Brooklyn campus. They have hired an attorney and are exploring the possibility of a lawsuit. The fight over Shulamith points to the changing character of Midwood’s Jewish community as it is being pulled to the right religiously and as Sephardic Jews increasingly buy up real estate in the area. And it is emblematic of other struggles within Orthodoxy pitting centrists against more right-leaning elements. Shulamith has a long history in Brooklyn, first in the Borough Park section and later in Midwood. Rabbi Abraham Lieberman, head of Jewish studies at Shulamith in Brooklyn, gave weight to the argument around population shift. “Demographics have changed tremendously. The Modern Orthodox community in Brooklyn is not what it once was; it’s more a yeshiva world. Flatbush has now moved more to the right and most of our constituency is in Long Island and Teaneck. Some are still here but not enough to make a big impact,” said Rabbi Lieberman. Still, he added, rumors that the school will close entirely are unfounded. Many of the parents who don’t buy the numbers presented by Rabbi Zwick have banded together and hired an attorney, Robert Tolchin of Jaroslawicz & Jaros, LLC. At least 60 parents have so far signed authorizations for Tolchin to represent them. The parents’ group is considering a lawsuit against the school, which they say has not been transparent in the proposed sale of the building, election of board members and general school issues. WHY NOT WORK IT OUT IN A BEISDIN LIKE THE RCA??? any one knows who this Robert Tolchin guy sounds like i see him the news often ? I really dont see why in this day and age we still need a school like Shulamis was! B"H Klal Yisruel has made great strides, the Hiemeshe schools are very good, we dont need a Zionist establishement among Frum Jews anymore! I am a yeshivisha parent. If you look at the way the girls from shulamis daven,bentch,& their middos in general you will understand why we still need such a school today !!! Halivay oif the Bais Yaakov girls Gezuckt. Why don't you start a anti zionist tznius police squad like the wahabi muslims. Or take every Jew and make him just like you. A friend of mine who lives in flatbush is very upset about the possible closing of the school. She is pretty much Modern orthodox; has a tv, lets her daughter wear short sleeves & anklets til about age 9 or so, and refuses to be a hypocrite by sending her to a school where TV isnt allowed, and wants her daughter to be able to wear short sleeves in second grade. so, she is furious if the school will close. there is still a need for this kind of school in midwood. I am not Yeshivish, I come from a Chasidish background. I am a proud Shulamith parent and I owe a great debt of gratitude to Rabbi Lieberman. Why? Because If you look at the way the girls from shulamis daven,bentch,& their middos in general you will understand why we still need such a school today !!! Halivay oif alle frume girls Gezuckt. I didn't read or hear anything about the school closing. It's all about selling their huge aged campus that was originally built as a movie studio. It must cost a lot to maintain and that huge property will fetch between $20 and $25 million which I think could buy or build a more ecconomical building for the 300-400 students. Since when is an attorney going to be sucessful in a lawsuit? He's going to argue that someone starting first grade has an implied contract to get through 8th? He's going to want a refund from building fund that was paid off 10 years ago? What chutzpah of the parent body. They can go through due process, like electing Board memebrs who may rescind the decisions, or pay double the tuition to keep the finances afloat with half the right enrollment. But to sue? Smells like a lawyer somewhere is involved. Money is a part of your everyday life. You use it to buy the things you and your family need and want. Buying food, paying rent or mortgage, buying clothes, taking a vacation, and paying for child care are some of the necessary things that require money. No matter what your personal beliefs are about money, we can all agree that it is part of our lives. ITS ALL ABOUT MONEY!! I think if the parents would quietly go to the trustees and administration of Shulamith and ask for a hearing at the RCA auspices, which is accepted by the Shulamith community, that the RCS should arbitrate this whole situation. If the parents can proove that Shulamith can stay open and be a viable institution, I'm sure that the trustees would agree. But the current campus is much too big for the amount of students remaining. The fact is that Flatbush demographics have changed drastically over the last 20 years. The trustees and adminstration recognizes this and can't justify spending huge sums of money to hold up such a large school. The parents seemingly refuse to see reality. But there must be a compromise position that the RCA would be able to arbitrate. Economically it makes sense to get rid of the building... but not to leave the borough, there are still many, many families in Brooklyn that are somewhere between ModOx and Yeshivish for whom Shulamis is the perfect fit. To force these families to either a) have their kids shlep out of town to go to school everyday, or b) keep their kids in the area but have to send them someplace they wont fit in hashkafically is very unfair. Marine Park would be a great location for Shulamis to move to. There is much Jewish growth in the neighborhood, a great park to take advantage of, and real estate prices are still much lower than smack in the middle of a commercial area in Midwood. They could sell the current campus, and build up a new place with plenty left over to invest, without leaving the borough and their constituents. Shulamith is a wonderful school. I am more impressed by my friends who graduated from there than those who graduated from Bais Yaakovs. It's all in their midos and their ehrlichkeit. Maybe they should move to Kew Garden Hills -- there is no comparable school in the area. I would send my daughter there! "Orthodox but Zionist, religiously fervent but engaged with the wider, secular world "
This is written incorrectly, it should say, "Orthodox AND Zionist, religiously fervent AND engaged with the wider, secular world", rather when using the word BUT the next sentence is looked at in the negative. "really dont see why in this day and age we still need a school like Shulamis was"! Thank you for reminding me that small-minded, non aware, hearsay people are still rampart in klal yisroel. How does one simply close down a school with over 500 students still attending? Was a single Rav consulted? Which yeshiva is going to absorb these girls? How many will end up in public school? Rabosai, I know that 22 million dollars is a lot of money, but sometimes 22 million dollars can really blind one's vision. And to take the money and send it to another community so they can have their own building does not sound like YASHRUS to me. To those who ask about Beis Din, see the article in the May 30th edition of the Five Town's paper, The Jewish Star. go to RCA but the bottom line is I would go. I’m a Jewish man. If they call me I’m going. You can't fight the demographics. The school in Brooklyn is literally half the size it was only ten years ago, and it's getting smaller every year, as the larger classes graduate and are replaced by much smaller classes. No one has a right to live wherever they want and expect there to be a school there to fit them exactly. Can you imagine someone living in Teaneck, and complaining because there is no Satmar shteeble? Or living in New Square, and then complaining that they have no Bnei Akiva school to send their kids to? Baruch, well said! Noone else hit the point. Why must they be forced to stay there? If the clientele of the 'hood is not for Shulamith then they have the right to move. Are all these shrayers gona reach into their wallets to help pay the mortgage? They could make a mint selling the building. They could take the money and use it for good purposes. 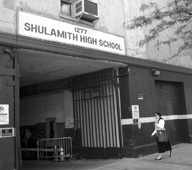 I am not disputing the need for a school like Shulamith however if they see they cannot survive in a neighborhood like M & 14th they need to do the smart thing and move someplace where they could survive with hatzlocha. Baruch, did it occur to you that some people didn't register because of the rumors that the school's moving, a rumor that's about 10 years old? It's not like we just moved to New Square and expect a school like Shulamith. It's here, we're here, and we need it. The rumor in shul was that the land is being sold to build low income housing. Why is rabbi Zwick not opening the books and being so secretive? Why is the buyer a secret. The reason "they" must stay in Brooklyn is because "they" are a Brooklyn school. Like it or not, there are Modern and Centrist Orthodox Zionist families living in Brooklyn. There are schools out there who would consider a number like 300 proof of phenomenal success and here mid-500s are held up as proof that there are no takers?? The fact is that the 500 plus families there now are there INSPITE of efforts by administrators for several years to discourage enrolement so that they could justify the move to Long Island. why the lawsuit to compel the school to show papers? Because they have flatly refused. The administration has treated and continue to treat the parent body (student body) like @#$ (insert explitive). All decisions are secret. The sale itself was secret until someone found enough rumor and pushed hard enough. It is still secret who the buyer is. And very strong rumor is that this buyer is a board member buying the property in a questionable transaction - a rumor which the administrators could adress by a simple disclosure -- which they refuse to do!!! All that the parents ask for is to see what the decisions were and how they were made! If it turns out that it was apropriate to sell the current building - well and good. But what of some effort to buy another building in Brooklyn? This organization which was founded for the express purpose of providing an education to Jewish girls in Brooklyn seems to be getting its funds diverted to another city -- leaving the Brooklyn girls with ...what? And -- Who will take these 500plus girls? Demographics or not there are still over 400 girls who need to be educated. They need a building to do it in whether it is the one they are currently using or somewhere else. The problem is that they are NOT using the money they are getting for the building to find one here in Brooklyn. The money is being given to the Long Island Branch for a campus in Inwood. Would you send your 5 year old daughter on a bus to Inwood? I think not. The question is not selling the building but what are they going to about these girls and young women who have NO where to go. The administration is not telling the parents ONE thing. They have sent home copies of newspaper articles with no explanation and little else to make us feel better. I sure do not feel better when I have no idea if my daughter will have a place to go in 2 years. The bottom line is that Shulamis is a community school and was established and chartered to meet the needs of educating girls in Brooklyn.Its not a business that moves away and abandons its old customers as the area changes.Its purpose should not be to make money.The building cannot be sold so a new building can be built to serve girls in an entirely new area.$27 million is enough for two buildings but the management of the school is not transparant about their plans,they say one thing but do another and its their way or the highway. This is an old problem, when schools downsize or close, who gets the $$$, who makes the decisions, who can or can not sell and to who? Amazing how the speculation as to how many dollars the school is getting for the building keeps going up. Now we're up to $27 million? I highly doubt it in the current real estate market. 1. Good, there are still 400 girls that need to be educated. Given enrollment trends and neighborhood demographics, next year there will be less, and next year less than that. Does Shulamith have to stay as long as there is one student left? Come on. There used to be many yeshivas in East New York, and in Crown Heights, and other areas. Did those yeshivas have to wait until there was literally ZERO demand before moving? The ones that did eventually closed down, and pretty quickly. The ones that moved were the ones that survived. 2. Why do you think there were "rumors" of Shulamith closing but not, say, of Bais Yaakov of Boro Park closing? The "rumors" directly tie in to the (correctly) perceived lack of future demand. Anyone who thinks that "rumors" are primarily responsible for Shulamith's enrollment problems in Brooklyn probably thinks that Young Israel of Boro Park/Bethel struggles because it doesn't serve good herring at shalosh seudos. I think Prospect would be a good replacement for the Shulamith families. What is the big deal? I remember when Shulamis was in Boro Park and moved to Flatbush because they did not have enough people interested in Boro Park. I do not remember hearing major complains then. Why the fuss now. If they need to relocate what is the big deal???? The number was $27 mil and Joseph Guttman was the buyer.He doesnt have any immediate plans for the building which Shulamis has two years to vacate.He has to make the purchase now as he had 1031 exchange money needing to be used.He was the only one who could do this with the current credit crunch out there.Rabbi Zwich has bought two Inwood buildings(Inwood is one of the five towns) that used to be the Forest lab complex. The purchase price was around 5 mil. Zwick has no right to use the Shlamis buildings as his own piggybank with no oversight other than his hand picked board. Please don't mention Teaneck and Shteeble in the same sentence. Hey I was in Woodmere for Shabbos, saw so many black hats, thought I was in Lakewood. Saw the new glatt giant superstore on the way into Woodmere,and chavrusas studying in the ailses. Orthodoxy is moving to the right all over the world, even the five towns. People feel very comfortable identifying with extremism. It's frightening for the "followers" of our society to walk a moderate line; they find moderation threatening to their psyches. They're much more comfortable going the extreme route, especially in religious matters. It's so much easier, and doesn't open you up to criticism. After all, you haven't "compromised." Hence the comment from Dave, above. It's easy for the "Frumies" (sorry, but that's my name for the "Daves" of the world) to criticize those who understand and appreciate subtlety and the complexities of life. There are many COMPETING GOOD VALUES in the world. The Torah encourages us to THINK and FEEL our way aroung issues. Our lives consist of weighing complex matters at any given moment, and often there are many, many factors to take into consideration when making a decision. That is a scary concept for some. Shulamis, in my opinion, is wonderful at teaching its students to look at all sides of an issue. Doing this is NOT EASY, and requires time, energy, effort, and keen insight. More important, it requires courage to sometimes make the less popular move, the one that makes you look like you're compromising. Shulamis girls whom I have met seem to understand this, and don't just do what they're told to do "BECAUSE." They actually think things through. We need a Shulamis school in Brooklyn, PARTICULARLY because of the polarization and extremist behavior that exists in so many areas. It's getting harder and harder for me to find someone just to talk to!! WE NEED SHULAMIS!!!! There are big buildings serving as shuls in Brooklyn worth millions which once upon a time crammed their members in. These days you can hear your voice echo, it's so empty. I wonder what will become of those. Thank you Shulamith! for having been my partner in raising my daughter to be the erlich, fine young adult she is. She and her friends shine among the girls in the Midwood community. Any that meet them know them to be unpretentious, loving of torah and mitsvos, chesed, and never a word of l"h. I have learned so much being the parent of a Shulamith girl. The hashkafa is to bring girls into their fullest potential in every way, to use secular knowledge to support their avodas Hashem. Whatever happens, Thank you! Rabbi Zwick, Mrs. Nekritz, Mrs. Aretz, Rabbi Lieberman, and all the teachers- who do not hesitate to be open to answering questions, who have inspired my daughter to be the person she is today. I believe that I have been remiss all these years for not sharing more openly with the more "yeshivish" community regarding the the unique spiritual education girls at Shulamith receive. Each girl is encouraged to use their individul gifts to become conscious participants in Yiddishkeit. The results are young ladies who care little for the material and more about the ruchnius in their lives. These are the girls that will pass on the mesorah in a meaningful way. These are the girls that will make solid homes and partners in life- I will continue to hope for the continuation of the only school in Brooklyn that provides this precious service. As a woman I am upset I can't send my daughter to Shulamis again. Why can't my daughter complete 8th grade? This is not right. I do not feel that there is a need to take the school to court. The school can legally do whatever they want but they should do the right thing and let me daughter finish 8th grade. Kudos to Norman Parent, Teanecker, ShulamisBrooklynGirl, ScaredoftheFrumies, and Metullah! You said it, and so well. I wonder what the justification to close a school would be? If your clientel move more to the right, then you must move to the right -- not close the school and run out of town. The Jewish community of Brooklyn own the school not five towns. I find it hard to believe that any rov or any secular court would approve of this. Many of the posts ask why don't the parents sit down and work with the current "Board". We have tried many times but to no avail. The current administration has denied the Brooklyn parents any representation on the Board, and is scurrying to hide all financial records. Rabbi Zwick should open all Financial records to prove that a school with over 500 students (paying more tuition than any Bais Yaakov)cannot exist in Brooklyn. Is he Hiding anything. Is this another Chillul Hashem waiting to happen? 1. All of you living there should be in eretz yisroel. Moving from one golus community to another is just a waste of your lives. 2. The Zionist/Orthodox issue is dead lemayseh. The frum world is almost all de facto, if not de jure, zionist, and the frei world is almost all de facto, if not de jure, non or anti-zionist. You know it's true too. You might as well admit it. Every shabbos, guys from the Mir and other yeshivos- including Brisk, go out to spend shabbos in the religious Zionist settlements in Yehuda and the Shomron, and they are even beginning to marry the girls. "Klal Yisruel has made great strides, the Hiemeshe schools are very good, we dont need a Zionist establishement among Frum Jews anymore"
"Klal Yisruel has made great strides, the Hiemeshe schools are very good, we dont need a Zionist establishement among Frum Jews anymore." Since when are my children not part of Klal Yisrael? Shame on you! And for the record, the Torah education given over by Shulamith is one of the finest anywhere. I am amazed day after day at how my daughter, who is, and always will be a member of Klal Yirael, is growing as a fine Jewish girl. In addition to a Torah education, the secular studies department far surpasses anything in just about any "frum" yeshiva in Brooklyn (I teach in one so I speak from experience). How can a yeshiva call itself frum without allowing its children to be educated? One can be both a Zionist and frum at the same time. It can and is done all the time. How can a Jew look the other way when it comes to the neshamot of 364 Jewish girls? The problem lies in those who wag their their fingers at others. As a Jew, you should be ashamed of yourself. Who are you to decide who is frum and who is not? By the way, to compare East New York to Flatbush is absurd. There are obvious reasons why there are no yeshivot left in East New York. And the last I checked, one Jewish neshama is equal to the world. Isn't that what we are taught? Do you want to be the one to tell my daughter she is not Jewish enough to live in Flatbush? My family has been here for over forty years and I think I have earned the right to educate my daughter in a manner I see fit. Simply because I do not want to send my daughter to a more "frum" school (frum by your standards, not mine) does not make me a terrible person. Personally, I think my daughter has a much greater chance of growing up and remaining true to Judaism attending Shulamith than most other yeshivot in Brooklyn. Shulamith took in a total $6,371,410 in Fiscal year ending August 31, 2006. They claimed expenses of $6,964,439 leaving a deficeit of $593,029. They list their assets as $6,964,675, including the building which they list as being worth $6,349,048. M Zwick Exec. Director $80,162. People, learn to use the internet. There's a lot of information out there. I would pit the Shulamith Jewish education against any yeshivah in Brooklyn today. The yeshivot that claim to provide a proper Torah education to its children will surely embarrass themselves. "Every shabbos, guys from the Mir and other yeshivos- including Brisk, go out to spend shabbos in the religious Zionist settlements in Yehuda and the Shomron, and they are even beginning to marry the girls". As a guy who goes out to Yehuda and Shomron on shabbos to get out of Yerushayalim, we love the grass, peaceful enviornment, davening and people to talk to. The yishuvim are full of people with emunah and they have a positive influence on US, halevai that the tzniuusdik girls there would even be interested in us for shidduchim. The lucky guys who do become more chardel then the girls becoming charedei. Matzahlocal 101: Don't be such a weisenheimer. Did you look at those 990's? They're signed by Rabbi Zwick, not an officer? What's up with that? And why do they valu the building at $6 million when they're selling it for $20+ million? With a building worth that much, and intrest rates so low, surely there are other options to finance a school. And where did those numbers come from anyway, considering that the school hasn't had an audited financial statement in YEARS! Maztah locoal 101: why was is so necessary to publish other peoples parnassah? is it anyones business? the issue at hand is the school either closing or moving and how to solve the problem so everyone is happy, not how much the prinicpals made in a year. the point is not to bash other schools, look i went to shulamis and i owe them alot inlcuding Rabbi Leiberman who gave me certain things in life that just thanking him wouldnt even be the beginning of what i owe him. it would be a sad sad day, if the school closes and loses teachers and m'chanchim like rabbi leiberman. $27 million? $5 million? Ridiculous. Don't just spit out numbers, that make zero sense (who is selling building complexes in Inwood for $5 million, and where can I buy some?). If you think you have "inside information" of any sort, I can tell you with full confidence you are full of baloney. "By the way, to compare East New York to Flatbush is absurd. There are obvious reasons why there are no yeshivot left in East New York." Yes, the same "obvious reasons" that Shulamith has no long term future in Brooklyn. Regardless of whether a neighborhood no longer has Jews (such as in East New York), or no longer has Jews willing to send to a school with a particular philosophy (as is increasingly the case in Flatbush), the end result is the same for that school. It will close down. "And the last I checked, one Jewish neshama is equal to the world. Isn't that what we are taught?" Okay, so that means what exactly? If your daughter was the only person in Brooklyn who wanted to attend Shulamith, then Shulamith would be obligated to stay open for the sole purpose of educating her? "Do you want to be the one to tell my daughter she is not Jewish enough to live in Flatbush?" Your daughter is Jewish enough to live in Meah She'arim, as far as I am concerned. Just don't expect to find a yeshiva there that is exactly to your liking. "My family has been here for over forty years and I think I have earned the right to educate my daughter in a manner I see fit." Last time I checked, living someplace for forty years didn't form a basis for any fundamental rights, educational or otherwise. EVERYONE has a right to education their children as they see fit. And Shulamith School has a right to relocate to a place where it can both survive and stay true to its educational mission -- to provide a Torah-true religious education, high level secular education, al pi halacha, in the context of a religious Zionist philosophy. Baruch, the lie that there is no MO community left in Brooklyn is only furthered by people like you. Shulamith would have plenty of students if recruitment was done properly. Yeshiva of Flatbush has a healthy amount of MO students and I am not referring to the Sephardic students (check the numbers if you don't believe me, I did). And if you think Meah She'arim would accept us then you have never been to Meah She'arim (where I have had rocks thrown at me because apparently I am not Jewish). Of course Meah She'arim would not have a yeshiva for me. I wouldn't expect them to have one. The difference is that Shulamith accepted by daughter with the hidden knowledge that they had no plans to remain in Brooklyn. They abandoned me. She at least has the right to complete her education. I'm a part of the MO community. My kids are in Yeshivah of Flatbush but i am concerned what will happen to Shulamith. We forget that we are all JEWS regardless of affiliation. Shulamith accepted girls from different backgrounds and gave them a chance to lead jewish life. It's unique in what it is doing. There are still a big number of girls to attend this school. There were no compain to increase the enrollment to school in the last 10 years! Of course, it's costly to maintain this building but the school could make money renting exsessively. It was not done by the board - huge luck of management! All right, sell the school. Then the question comes: "Where and who will get the money?" Why the profit should go to Long Island branch? Brooklyn parents paid their share of the Building Fund. The problem that the building doesn't belong to the Board but to the parents. Hence, parents must to deside where the money will go. Definitely, the Board must be reelected. Don't be passive Shulamith! Fight! Fight for your existence in Brooklyn! I need you! Did anyone at the parade today notice that Bnot Shulamith had their own gorgeous banner and different t-shirts than the Brooklyn girls? They're obviously not part of Brooklyn's school, so why should they get our building? >> Matzahlocal 101: Don't be such a weisenheimer. Did you look at those 990's? They're signed by Rabbi Zwick, not an officer? And why do they valu the building at $6 million when they're selling it for $20+ million? Maztah locoal 101: why was is so necessary to publish other peoples parnassah? is it anyones business? other posters complained the school won't share any information. I posted the major figures as stated on the 990, a matter of public record and available to anyone who wants to look at them. But as long as you asked, Rabbi Zwick got a $22,000 raise over the amount stated on the previous 990. (guidestar.org) Now are you happy? To KSIB 7:56 p.m.: Please don't let this degenerate into a Brooklyn versus Long Island issue. You say "Why should they get our building?" Obviously, the Long Island parents (including myself), would say that it is not "your building" anymore than it is "our building." The people that donated the money that helped buy the current building are all older or have passed on, and their granddaughters are as or more likely to be attending the Long Island division as Brooklyn. The Long Island parents would also note that they have been paying significantly higher tuition (and tuition realization) than the Brooklyn rate for the last ten years, plus paying into a building fund as well (which I have no doubt has been used to fund operating deficits, rather than actually set aside for a building), and seeing nothing out of it, living as we are in THREE different, substandard spaces. So the Long Island parents have plenty to complain about, and I'm sure the Brooklyn parents do too. But us versus them is really not a helpful approach. Plus, you are wrong about the parade. The elementary school students all had the same green t-shirts. What you noticed (and automatically jumped to the wrong conclusion about) was that the HIGH SCHOOL girls had different t-shirts than elementary (black with pink sleeves). (As you may know, Shulamith L.I. division has no high school). LIP, first, it is our building -- our girls are going to school there. You're not busing your daughter to Brooklyn, are you? And I'm still paying the building fund. Second, I know that the high school girls had black and pink shirts. They marched in front of the middle school girls. The Long Island girls marched behind their own banner, as if they're a different school, and they wore different green shirts. I was there for over 2 hours, and LI girls came an hour after we did. In a different green shirt. I agree with you - if should not turn into Brooklyn vs Long Island problem. 1. The founders of Shulamith meant it to benefit their community - which is Brooklyn. I am sure their descendants live all around the world - so why pick Long Island? How will you feel in 20 years when the school moves again? And it will be your and your children's daughters with no place to go then. It is easy to discount and overlook other person's concerns. Did the founders mean for the school to be mobile? 2. How do you know that our tuition is 'significantly' lower - the numbers were not that far off the last time I checked. 3. It is not our fault that you are in three different substandard spaces. The bottom line is - two years from now a lot of girls will not have a school, and that does touch a raw nerve with a lot of people. And Keep Shulamith in Brooklyn - does a shade of green matter so much? It seems like all of us have a problem. Shulamit started off in Boro Park. Can you imagine if the school was still there today? How many of you would send your daughters there instead of Flatbush? I know that BP and Flatbush are closer to one another than Flatbush to Inwood, but the time has come to move. From what I heard they are planning to sell the building. Kol HaKavod to them for selling the building and using the money to help their other school in Inwood. I don't understand how the parents think they OWN the school because they pay tuition or building funds. Last I heard building funds were to help fund the building. If they paid of the mortgage then it is to help with the daily maintenance. If the building is as old as you say it is, it sure needs maintenance. So they sell the building and move somewhere else. What is wrong with that. I keep hearing there are 350 students, and then 400 students and then there is over 500. Make up your mind already, and give a real number. If the board feels that they are losing money by keeping the school in Flatbush why are the parents so set on fighting that fact? Most schools are in debt. If they find a way to not be in debt, then let it be. I am sure there are schools that you can send your girls to. Try Prospect, Yeshiva of Flatbush, or get everyone together and open your own new school and see how fast you are willing to keep it in Flatbush. Again, remember, this school was a Boro Park school! In response to "What is the question says"
The subject is a bit more sophisticated then you are portraying it. The current "Board" actually knows that what they did is ethically and legally wrong. They are currently looking for ways to extricate themselves out of the mess that they created for themselves. While the parents in Woodmere are all giddy and making senseless blanket statements, the Board members are in contact with both the parents in Brooklyn and their lawyers to try to find a graceful exit from their capacity as Board members. That is an incorrect analogy. There are actually plenty of parents that want to send their girls to Shulamith once they see the simplicity the girls represent - girls in Shulamith are barely interested in things materialistic. My daughter has attended since nursery and is quite grown now. She and her friends daven beautifully, have sweet midos, and I have NEVER EVER heard any of them speaking loshon hara (mind boggling). Never mind the level of true spirituality and love of chesed (by practice not rhetoric) that is fostered in the school. I have friends who have their daughters in other "frumer" neighborhood schools who are faring worse, nebach. Whose biggest worries are what Totty is going to buy them for Afikomen, and what car their parents are driving. Anyone who truly knows Shulamith girls knows what the school is really about and why we still need it here. The bottom line is, the administration was not into PR, they were turning girls away for several years now (in view of a move to Long Island?). Had we, the parents of Shulamith girls, known of the financial threat to our school a few years ago, we would have been happy to share our happiness,success, and the partnership we had with the incredibly devoted teachers and administration, and speak of it with the surrounding communities. Unfortunately, there are some folks out there who believe that only a "yeshivish" lifestyle is acceptable. In Shulamith, a wide range of girls are present in the student body, enriching the girls' understanding of the diversity of Klal Yisroel. My daughter grew up knowing girls whose parentage and Jewish culture were diverse and respected. Her heart is devoted to an authentic Yiddishkeit- where her every action is informed by Halacha and Torah. Halivai by the other neighboring schools who at times appear to demand a robotic performance of Judaism. Let's continue to daven for a just resolution to meet the needs of many parents and children living in Brooklyn.